A Real Pair of Characters! I had a request – at fairly short notice – to make a cake for a set of twins who had chalked up 40 years of age. I had never met either of them, so when I was asked to put figures on the cake to represent them I thought it would be a bit of a challenge! 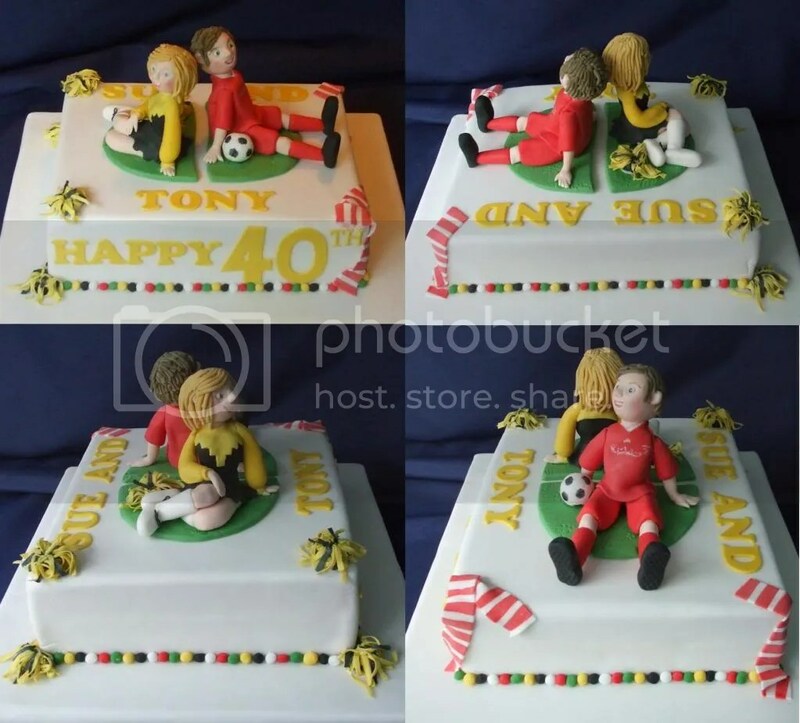 Fortunately, I was also told that they both dabbled in sports with Sue being part of a Morris Dancing Troupe and Tony being an avid (Liverpool) football fan so this gave me something to include to suggest who the two characters might be. I was given access to a photograph of the uniform for the Morris Dancing Troupe and, of course, the Liverpool strip was easily found for reference! The colours of these ‘kits’ rather dictated the colour theme for the cake so it was then just a case of creating the characters. Over the years I have done a lot of life drawing and sculpting so am fairly familiar with representing the human form in 2 and 3 dimensions – but using sugarpaste reinforced with CMC as a medium has its own challenges! I wanted to try to make the two figures’ positions reflect their different sexes and so tried to do a fairly demure pose for the ‘girl’ and a rather more blasé pose for the ‘boy’. I am really quite pleased with how it turned out and the lovely lady who ordered it said it brought a little lump to her throat when she first saw it so I think she was fairly pleased! I hope Tony and Sue liked the little pair of characters too!